* The presenters for the TONY Awards have been announced. Some of the stars rounding out the list: James Gandolfini, Jeff Daniels, Jane Fonda, Edie Falco, Chandra Wilson, and Audra McDonald. Make sure to check out the TONY Awards website to see the complete list. 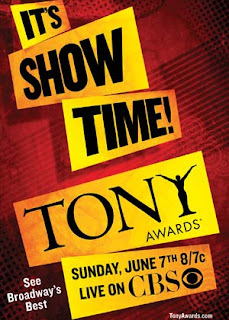 AND, don't forget to watch the TONYs on Sunday, June 7th on CBS. Check your local listings. * Well, Ladies and Gents, the figures are in and Broadway musicals and plays grossed approximately $943.3 million during the 2008-9 theater season. That is a slight increase over the previous season and enough to set a new record for total grosses, according to data released this evening by the Broadway League. The previous record was set during the 2006-7 theater season, which had total grosses of $938.5 million. According to the NY Times, during last summer and fall, a few producers prepared for the recession by postponing or canceling planned Broadway shows, and a few others shuttered long-running shows such as “Hairspray” and “Spring Awakening.” Some cited a lack of capital from investors; others were concerned that potential audience members would stay away due to financial constraints. This shows the power of the Arts. People will do anything to be able to get some place where they can sit and forget the difficult times that loom over them. * And last, but not least - another potential guilty pleasure. Bravo is announcing a potential new arm of the "Real Housewives" brand. That's right folks - the Real Housewives of DC. As in WASHINGTON DC. Oh, wont that be rich?